Mardi Gras Indians (also known as Black Masking Indians) are black carnival revelers in New Orleans, Louisiana, who dress up for Mardi Gras in suits influenced by Native American ceremonial apparel. Collectively, their organizations are called "tribes". There are about 38 tribes. They range in size from half a dozen to several dozen members. The groups are largely independent, but a pair of umbrella organizations loosely coordinate the Uptown Indians and the Downtown Indians. In addition to Mardi Gras Day, many of the tribes also parade on Saint Joseph's Day (March 19) and the Sunday nearest to Saint Joseph's Day ("Super Sunday"). Traditionally, these were the only times Mardi Gras Indians were seen in public in full regalia. The New Orleans Jazz & Heritage Festival began the practice of hiring tribes to appear at the Festival as well. In recent years it has become more common to see Mardi Gras Indians at other festivals and parades in the city. Notwithstanding the popularity of such activities for tourists and residents alike, the phenomenon of the Mardi Gras Indians is said to reflect both a vital musical history, and an equally vital attempt to express internal social dynamics. Mardi Gras Indians have been parading in New Orleans at least since the mid-19th century, possibly before. The history of the Mardi Gras Indians is shrouded in mystery and folklore. In 1740, New Orleans' Congo Square was a cultural center for African music and dance. New Orleans was more liberal than many Southern cities, and on Sundays African slaves gathered to sing folk songs, play traditional music, and dance. The lively parties were recounted by a Northern observer as being "indescribable... Never will you see gayer countenances, demonstrations of more forgetfulness of the past and the future, and more entire abandonment to the joyous existence to the present movement." The idea of letting loose and embracing traditional African music and dance is a backbone of the Mardi Gras Indians practice. As a major southern trade port, New Orleans became a cultural melting pot. During the late 1740s and 1750s, many enslaved Africans fled to the bayous of Louisiana where they encountered Native Americans. Years later, after the Civil War, hundreds of freed slaves joined the U.S. Ninth Cavalry Regiment, also known as Buffalo Soldiers. The Buffalo Soldiers fought, killed, forced and aided the mass removal and relocation of the Plains Indians on the Western Frontier. After returning to New Orleans, many ex-soldiers joined popular Wild West shows, most notably Buffalo Bill's Wild West. The show wintered in New Orleans from 1884 to 1885 and was hailed by the Daily Picayune as "the people's choice". There was at least one black cowboy in the show, and numerous black cowhands. On Mardi Gras in 1885, fifty to sixty Plains Indians marched in native dress on the streets of New Orleans. Later that year, the first Mardi Gras Indian gang was formed; the tribe was named "The Creole Wild West" and was most likely composed of members of Buffalo Bill's Wild West show, though the "Indian gangs" might predate their appearance in the parades. Mardi Gras Indian suits cost thousands of dollars in materials alone and can weigh upwards of one hundred pounds. A suit usually takes between six and nine months to plan and complete. Each Indian designs and creates his own suit; elaborate bead patches depict meaningful and symbolic scenes. Beads, feathers, and sequins are integral parts of a Mardi Gras Indian suit. Uptown New Orleans tribes tend to have more sculptural and abstract African-inspired suits; downtown tribes have more pictorial suits with heavy Native American influences. The Mardi Gras Indians play various traditional roles. Many blocks ahead of the Indians are plain clothed informants keeping an eye out for any danger. The procession begins with "spyboys," dressed in light "running suits" that allow them the freedom to move quickly in case of emergency. Next comes the "first flag," an ornately dressed Indian carrying a token tribe flag. Closest to the "Big Chief" is the "Wildman" who usually carries a symbolic weapon. Finally, there is the "Big Chief." The "Big Chief" decides where to go and which tribes to meet (or ignore). The entire group is followed by percussionists and revelers. During the march, the Indians dance and sing traditional songs particular to their gang. They use hodgepodge languages loosely based on different African dialects. The "Big Chief" decides where the group will parade; the parade route is different each time. When two tribes come across each other, they either pass by or meet for a symbolic fight. Each tribe lines up and the "Big Chiefs" taunt each other about their suits and their tribes. The drum beats of the two tribes intertwine, and the face off is complete. Both tribes continue on their way. In the early days of the Indians, Mardi Gras was a day of both reveling and bloodshed. "Masking" and parading was a time to settle grudges. This part of Mardi Gras Indian history is immortalized in James Sugar Boy Crawford's song, "Jock O Mo" (better known and often covered as "Iko Iko"), based on their taunting chants. However, in the late 1960s, Allison Montana, "Chief of Chiefs", fought to end violence between the Mardi Gras Indian Tribes. He said, "I was going to make them stop fighting with the gun and the knife and start fighting with the needle and thread." Today, the Mardi Gras Indians are not plagued by violence; instead they base their fights over the "prettiness" of their suits. The HBO series Treme features one tribe of Mardi Gras Indians, the Guardians of the Flame, in one of the major plot lines weaving through the series, featuring preparations, the parades as well as strained relationships with the police department. The song "Iko Iko" mentions two Mardi Gras Indian tribes. Beyoncé's 2016 visual album Lemonade showcases a Mardi Gras Indian circling a dining table, paying homage to the New Orleans culture. In the Freeform series Cloak & Dagger, based on the Marvel Comics characters of the same name, Tyrone Johnson's father and brother were Mardi Gras Indians prior to the events of the show. When Tyrone discovers his signature cloak it is revealed his brother was working on it while training to be a spyboy. ^ Draper, David Elliott "The Mardi Gras Indians: The Ethnomusicology of Black Associations in New Orleans", Tulane University PhD Dissertation, 1973. ^ a b c d e f g h i j k Smith, Michael, and Alan Govenar. Mardi Gras Indians. Gretna: Pelican Pub. Co. 1994. Print. ^ Flint, Timothy. Recollections of the Last Ten Years. Boston: Cummings, Hilliard, and Company, 1826. ^ a b c d Gaudet, Marcia, and James McDonald. Mardi Gras, gumbo, and zydeco: Readings in Louisiana Culture. Jackson: University Press of Mississippi. 2003. Print. ^ Brennan, Jonathan. When Brer Rabbit meets Coyote: African-Native American Literature. Urbana: University of Illinois Press. 2003. Print. ^ Bragg, Rick. "Another Battle of New Orleans: Mardi Gras," New York Times (Feb. 19, 1995). ^ a b Moser, Margaret. "My Gang Don't Bow Down: Mardi Gras Indian Chief Kevin Goodman leads his tribe to Texas," Austin Chronicle (May 5, 2006). ^ Gaudet, Marcia, and James McDonald. Mardi Gras, gumbo, and zydeco: Readings in Louisiana Culture. Jackson: University Press of Mississippi. 2003. Print. ^ Salaam, Kalamu. "He's the Prettiest": A Tribute to Big Chief Allison "Tootie" Montana's 50 years of Mardi Gras Indian Suiting. New Orleans: New Orleans Museum of Art. 1997. Print. ^ Baum, Dan. Nine Lives. Spiegal Paperbacks. New York: 2010. Print. ^ "The Mardi Gras Indian Of 'Lemonade'". NPR.org. Retrieved 2018-02-02. ^ "Cloak & Dagger Just Reinvented an Important Piece of Tyrone's Mythology". CBR.com. Retrieved 2018-06-22. Mitchell, Reid (1995). "Mardi Gras Indians". All on a Mardi Gras Day: Episodes in the History of New Orleans Carnival. Cambridge, Mass. : Harvard University Press. pp. 113–130. ISBN 0-674-01623-8. Dweulf, Jeroen (2017). From the Kingdom of Kongo to Congo Square: Kongo Dances and the Origins of the Mardi Gras Indians. Lafayette, LA: University of Louisiana at Lafayette Press. ISBN 9781935754961. 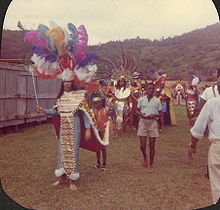 Wikimedia Commons has media related to Mardi Gras Indians. This page was last edited on 8 April 2019, at 23:54 (UTC).